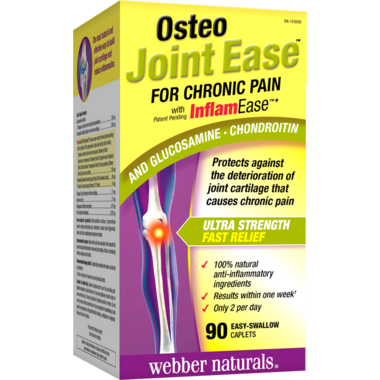 An innovative 100% natural formula that addresses pain associated with osteoarthritis and protects against deterioration of cartilage, Osteo Joint Ease from Webber naturals contains InflamEase, a synergistic combination of antioxidant, anti-inflammatory, and pain-relieving botanicals that relieve pain and inflammation fast and without side effects. wheat, gluten, yeast, soy, egg, tree nuts, or GMOs. Canadian brand. Recommended dosage (adults): 2 caplets daily preferably with meals or as directed by a physician.Use for a minimum of 1 month to see beneficial effects. Consult a physician prior to use if you are pregnant or breastfeeding, if you have gallstones or a bile duct obstruction, if you have stomach ulcers, excess stomach acid or if symptoms persist or worsen. Some people may experience mild gastrointestinal bloating, constipation or indigestion. Keep out of reach of children.